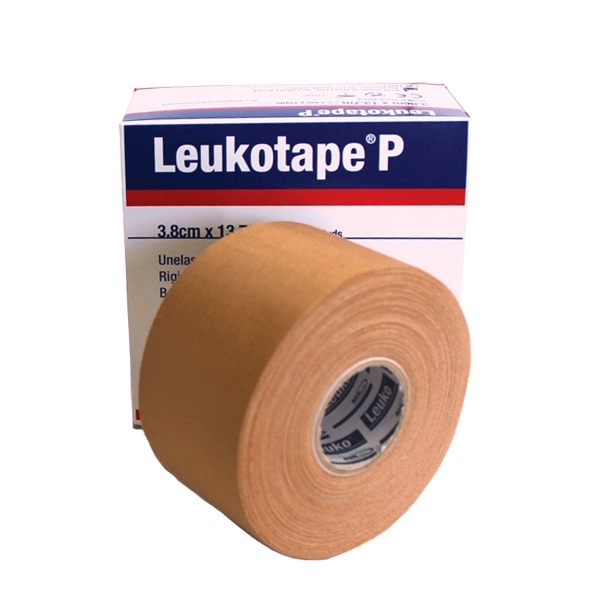 Extremely strong and rigid strapping tape—specially designed for patellofemoral taping, shoulder realignment and muscle retraining. High-strength sports tape with an aggressive zinc oxide adhesive. Easy to tear for quick application. Rolls are 1½" x 15 yards (45') each. Case includes 30 rolls. Contains latex; use Cover-Roll® stretch for a latex-free protective underwrap. This tape Is working miracles for severe, chronic headaches, suboccipitally sourced, and including pain sourced from torn upper cervical disks. Pain is reduced by 50 % or more, including severe pain that causes vomitting, although it takes a little longer to produce relief at those pain levels. Important that the tape be stretched very tautly from the posterior and lateral surfaces of base of the occiput to the mid-neck surface below. Put the neck in moderately full extension when applying, hold tape down as patient returns neck to normal position. Skin will be pulled a bit, but not uncomfortably so. Include lateral flexion with extension when applying at sides. The tauter the better, as long as the tape can stay in place. Have found that this tape works the best. Tapes that have give, including kinesiotape, do not work nearly as well.